She plunged into the market stopping only momentarily for a fortifying cafe au lait and to watch the colourful passing parade of characters. The market stalls wind their way through the town which is alive with boisterous merchants, musicans and people carrying baskets filled to the brim with fresh market produce. Some hours later, weary but triumphant, Robbi returned to the farm just in time for le dejeuner (lunch) of succulent fresh Rascas (fish) BBQed Provencale style. As we sat drinking and chatting Robbi leapt out of the car, crispy baguettes and golden loaf of olive bread in hand, carrying her "piece de resistance" - a beautifully packaged white box tied gaily with coloured ribbon, containing a most sumptuous tarte citron (lemon tart). All of our faces lit up in anticipation of the coming lemony delight and Robbi received a rousing round of applause. boy. Most importantly though, Robbi had inadvertently saved the day by purchasing her tarte citron which turned out to be Papa's favourite dessert. Not only that, she had bought it from the most prestigious patisserie in the area. As the love of good eating is central to French culture, this raised Papa's estimation of Robbi's shopping prowess greatly. 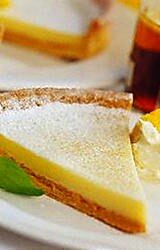 And oh yes, the tarte citron? It was fantastic!